The (currently) 6 100 km² park was first proclaimed as the Caprivi Game Reserve in 1966 and upgraded to the Caprivi Game Park in 1968. It was gazetted as the Bwabwata National Park in 2007 and incorporated the former Mahango Game Reserve. The park has had a chequered history as it was declared a military area by the South African Defence Force during Namibia’s war of liberation. It was not until after Independence in 1990 that the park could be properly run as a conservation area. A survey was conducted in the park at Independence to investigate the status of the fauna and flora after the military occupation and to assess the circumstances of the 5 000 people living in it. This survey laid the foundation for the current management approach in the park, which incorporates the needs of the people living there. 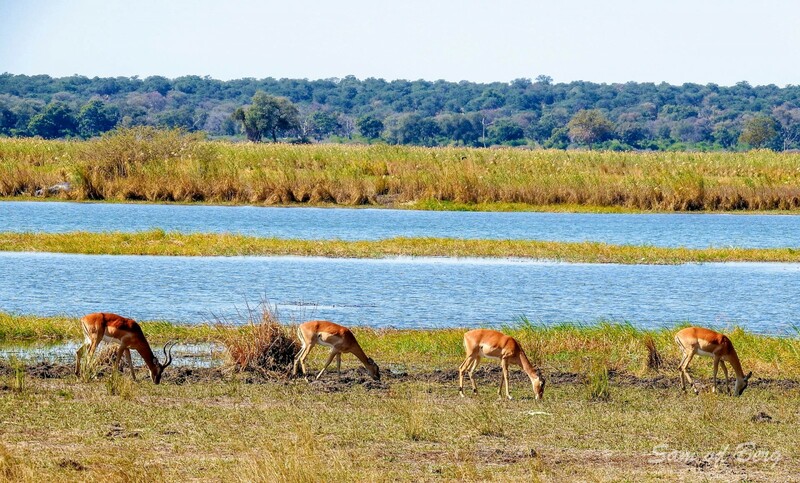 The survey also laid the foundation for the zoning of the park, which has a core conservation area in the west along the Okavango River, a multiple use area in the central part of the park and a core conservation area in the east along the Kwando River. Low vegetated sand dunes with old drainage lines (omurambas) in between. The Okavango River in the west and the Kwando River in the east. Broad-leafed Kalahari woodland with trees such as Zambezi Teak and false Mopane on the sandy areas, and Camelthorn and Leadwood in the marimbas. Reeds and Papyrus on the floodplains, which are lined with trees such as Jackal-berry, Mangosteen, Knob Thorn and Makalani Palm. Large concentrations of Elephant, Buffalo, Sable and Roan Antelope can be seen. Main predators such as Lion, Leopard, Cheetah and Hyaena occur. This Par is also one of the last refuges of the Wild Dog in Namibia. Common Reedbuck, Red Lechwe, Sitatunga and Hippo are found along the rivers. Birds include Wattled Crane, African Skimmer Western- banded Snake Eagle, Wood Owl, Pel’s Fishing Owl, Narina Trogon, Cape Parrot, and both Red-billed and Yellow-billed Oxpeckers. Nambwa (Mayuni Conservancy) and Bum Hill (Kwando Conservancy). The Kyaramacan S Association runs N//goabaca Campsite at Popa Falls on the east Bank of the Okavango River. Namibia Wildlife Resorts operates the Popa Falls Rest Camp on the west bank of the river. Most tourists are self-drive campers from overseas or within the region.